A photo exhibition by photographer Deepak Tolange kicked off on Thursday at IOE, Pulchowk Campus, Lalitpur. 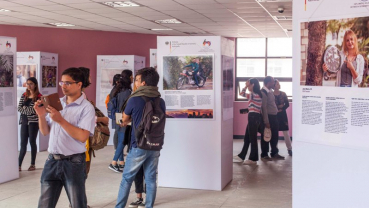 The photo exhibition is organized by the Embassy of Germany and Goethe Institute to celebrate 60 years of friendship between Nepal and Germany. On the first day of the festival, the deity in Machindranath Bahal is taken in a khat (palanquin) by eight priests and the deity is placed in the decorated chariot. 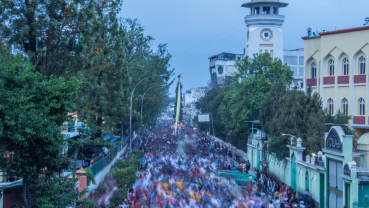 Then, the procession begins from Tindhara (Durbar Marg) and is pulled toward Asan. Priests do not eat anything on the first day until the chariot is brought up to Asan. Before that barber shaves their head around 9 am and they prepare Khat. After that they take bath and they get dressed in white. Prime Minister KP Sharma Oli unveiled book 'Marichika' written by author Mahesh Thapa amidst a program organized at the Prime Minister's official residence in Baluwatar on Friday. 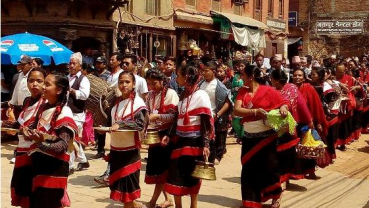 A major attraction of Bhaktapur’s Biska Jatra is ‘Swaga biyagu Jatra’, which means offerings to the deities. It is celebrated annually on the fourth of Baishakh. The exhibition 'Wooden Reflection' kicked off on Thursday at Arupan Art Gallery, Lazimpat. 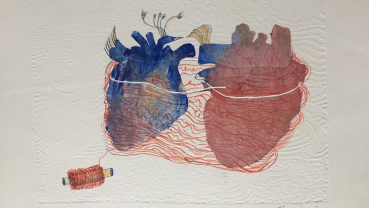 The exhibition features watercolor paintings by artist Roshan BK. The solo art exhibition contains a total of 16 paintings created by BK from year 2013 till 2019. 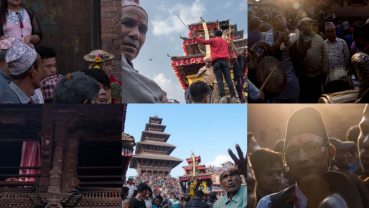 The exhibition 'Exploring Bhaktapur' is on display at Bhaktapur Durbar Square, Bhaktapur. The exhibition kicked off on Friday. This exhibition is the result of group of artists who came together for ‘Saturday Plein Air Workshop’ that was held in Bhaktapur. Buddha Krishna Baag Shrestha pierces his tongue every year on the jatra held annually at Khasi Tole, Bodey, Bhaktapur. Shrestha first pierced his tongue in 2005. However, it was in 2008 when he started doing it on a yearly basis. 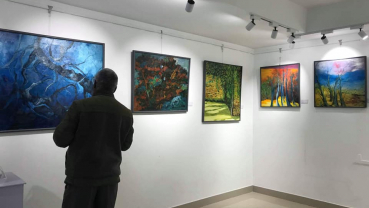 A solo painting exhibition of Sanyukta Shrestha, ‘The Fire of Change’ is all set to kick off at Classic Gallery, Lalitpur from April 16 to April 18. 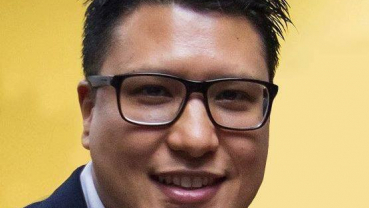 Shrestha is a London based software engineer who leads the cultural community of Newars in the capital of UK. 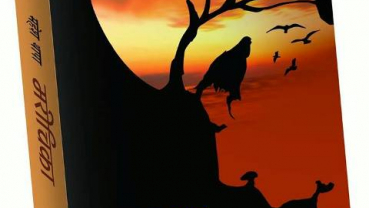 Shrestha is also the director of Nepal’s first animated movie, ‘The Legend of Shankhadhar’. 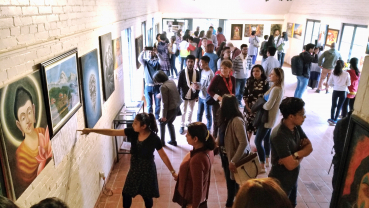 The exhibition featured SAA scholarship students supported by professional artists. SAA has been providing scholarship to 90 students. This 'Art Exhibition' is themed on “Nepal India Friendship”. SAA has been providing scholarship opportunities to talented and committed but financially limited and underprivileged Nepali children and youth since last seven years. All participants for this exhibition have been Academy’s scholars for the last five years. 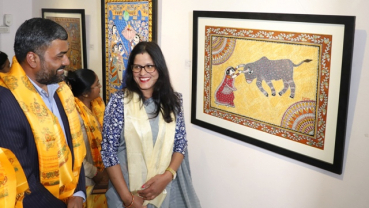 A total of 29 paintings are on display at the exhibition titled 'Colors of Change' by artist Ranju Yadav. The exhibition began on March 30 at Nepal Art Council, Baber Mahal. 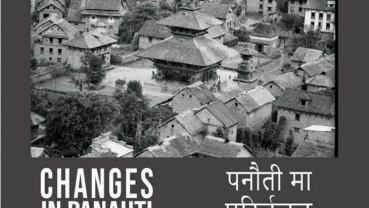 ‘Changes in Panauti’ is set to start from Thursday at Dhalko Bato, Pulchowk. The event is organized by Alliance Française Kathmandu. This is her 13 th solo exhibition where she has exhibited her artwork in Japan, France and Australia as well. In the exhibition one can view her artwork since 1999 and similar to the title of the exhibition she has created alluring nature on her canvas. Cartoonists and organizations contributing to the development of the satire-art genre were felicitated with ‘Baratha Memorial Honor’ and ‘Swarna Kuchikalam’. The solo art exhibition ‘Love Revisited’ by veteran artist Ragini Upadhyay Grela is on exhibition since March 13 at Le Sherpa, Lazimpat. The exhibition is dedicated to all the daughters and mother of this Earth and also to celebrate International Women’s day 2019.